Interviewer’s Note: Born in 1950, William Logan is a professor of English at the University of Florida, where he teaches in the MFA program. He is the author of nine volumes of poetry and five books of criticism, including The Undiscovered Country, which won the National Book Critics Circle Award in Criticism. He has also received the Randall Jarrell Award in Poetry Criticism from the Poetry Foundation, the Corrington Medal for Literary Excellence, and numerous awards for his poetry. His poetry criticism appears regularly in the New Criterion, and in many other magazines and journals. He is widely considered the most prominent poetry critic in the United States, and (as I wrote several years ago) his critical collections, taken together, form “the most complete analysis of contemporary English-language poets that we are likely to have.” The original interview was lost some years ago; this slightly altered version was provided by Mr. Logan and can be found as the final chapter of his book, Our Savage Art. William Logan: I was drawn to criticism blindly and without regard for the justice or ethic of the role. There may be artists born to criticize (and those whose every poem is a review)—my own criticism is no more than a shout from the back of the room. A sort of “Yeah, yeah,” a double affirmative that reads like dissent. As a critic I began with little except passion and an ornery nature. I spent my late teens and early twenties reviewing records for a grimy and now forgotten rock magazine, a suitably depressing place to learn a little, a very little, about critical prose. Such Grub Street reviewing had its moments—my opinion once so offended a record executive the next records I received were lovingly and individually vandalized. I had an absorption in music that at times approached the pathological and was the more delicious for that. On a whim, at the Writers’ Workshop at Iowa, I reviewed a novel for the student newspaper; with that callow introduction, I began reviewing fiction for the Chicago Tribune. My opinions were sharpened by putting them in ink—no doubt this is a common experience. At least, I’d like to think I’m not the only critic who discovers his mind (not the impulse of taste but the very words) in the act of writing. Those early reviews look hollow and ill-at-ease now. It wasn’t until I started reviewing poetry that my criticism showed an act of imaginative sympathy, a deeper dwelling as a reader. Perhaps I was more cruelly affected (or more irritated) by poetry, or perhaps as a poet I felt something more critical at stake. I don’t think poets owe a penny to criticism (though I’d support a law making every poet write a review as the price for writing a poem). I admit that some years after I innocently began I felt, if not a calling, at least a whispering. Criticism is an act partly moral; but it contains the devious and immoral pleasure of putting words on the page, of being forced to think about books. GD: What do you think the role of the poet-critic should be? What critics or poet-critics do you consider exemplary in this regard? WL: Some of the gestures of my reviews have paid homage to Randall Jarrell—I’ve alluded or mimicked, because his criticism is so often exemplary. Reviewing is a trade, even at times a rough trade; and Jarrell was the roughest and most cunning of traders. His distant forebears were Francis Jeffrey and Edgar Allan Poe. I owe deeper debts of inspiration to R. P. Blackmur, perhaps the most brilliant critic of verse in the past century; to Eliot, the critic most sensitive to the poet’s interior view of his art; and to countless others. If such a list seems to dress me in clothing that doesn’t fit, let me say that my criticism can never repay those debts. I’m not sure a “poet-critic” has a role, or should have one—I’m not even sure what a “poet-critic” is (it sounds like a mythical beast, part goat and part hyena). The term implies an equality or balance I doubt most poets feel, when they descend to criticism (it’s not poet=critic). At least, I’ve never felt it. It’s perhaps no accident that many of the best critics of poetry have been poets, since poetry matters so much to them and so little to anyone else—but isn’t it rather strange? (Critics of poetry have rarely been poets of the first rank. Coleridge, Eliot, Pound, and Auden are exceptions, not a norm.) The rough-and-tumble of criticism in other arts isn’t usually carried on by the artists. WL: I distrust the motives of the question. Much of what we dislike about the poetry around us won’t bother readers of the future, because it will have been forgotten. I doubt even the Pulitzer Prize winners of the past two decades will have many poems in anthologies half a century from now. This isn’t simply a problem with the prize, though it’s a scandal that Amy Clampitt never won it and another that Gjertrud Schnackenberg has yet to win it. Our poetry is healthy, if the sole measure is that there’s a hell of a lot. Much is mediocre, but most poetry in any period is mediocre. What bothers me, as a reader, is how slim current ambitions are—too many contemporary poems start small and end smaller. They don’t bite off more than they can chew—they bite off so little they don’t need to chew. They’re content to be trivial or frivolous, without remembering that frivolous poetry (the light verse of Carroll, Housman, Auden) has exceptionally high standards. Poetry is now too often a minor art, an art of the margins. No matter how many buses and subway cars carry poems (always little bite-sized poems), no matter how many poetry months there are (October could be declared a second poetry month—then look out! ), no matter how many poets laureate we have (and how easy their poems are to understand), it takes labor and education to read most of the poetry of the present and almost all poetry of the past. I have students who find it difficult to read Robert Frost—Robert Frost! In thirty years teachers may be moaning about students who find it hard to understand Seamus Heaney. Or Billy Collins! When poets are tempted to moan about the irrelevance of poetry, we might remind ourselves that playwrights and photographers and composers are worse off—poets can publish and be damned, but in other arts young artists have more trouble being seen or heard. GD: What do you think of the present situation of poetry criticism? Of its health? WL: It’s despicable that, too often, magazines have to fill what little space they leave for reviews with transparent forms of log-rolling and back-patting, the slouch of minor corruption (as well as the emollient cant of bad taste). Editors often complain that poets hate to review their contemporaries, because they’re afraid of making enemies. Perhaps this is cowardice at its most genial. When poets lather their reviews with nothing but diplomatic flattery (or criticism so mild it wouldn’t kill a fly), criticism has failed its readers. Reviewing is not a dangerous trade if the worst that can happen, even to a poet as good as Jarrell, is to be deprived of a few honors. What was Shaw’s remark about the critic? “His hand is against every man and every man’s hand is against him.” Any critic should give up the idea of winning awards. He shouldn’t want to win awards in the first place (it would suggest he isn’t doing his job—he hasn’t offended enough people). That doesn’t mean he shouldn’t accept an award—it’s rude not to accept gifts. GD: Eliot believed the poet-critic criticized poetry in order to create it, so that his views were often partial and dogmatic. Allen Tate said that the poet-critic “is not concerned with consistency and system, but merely with as much self-knowledge as he needs to write his own verse.” Whereas Randall Jarrell’s criticism does not seem so intimately linked to his poetry. The critic in him was an ideal reader, who rarely expounded ideas or clarified the intentions of the poet. The two roles seemed to exist in him separately. Do you see your own criticism as that of a poet’s, partial and dogmatic, or an ideal reader’s? Is there a vital connection between your own poetry and prose? WL: Within the narrow terms offered, I feel a stranger to both camps. I haven’t written criticism in order to clear a path for my own work, and I’m not sure my poems would have been different had I not written a critical word. I know what Eliot meant—criticism often seems not self-exculpatory or self-explanatory (in the sense that an artist explains himself to himself) so much as self-condemning. Criticism is written in a fallen condition—and perhaps allows the critic, as a soiled act of grace, an occasional glimpse into how language works. If there’s a connection between the labor of criticism and the languishing pleasures of art, it is that in both, at fifty, one can still be a student. I certainly don’t have a system, and to that extent must criticize as a reader—not an ideal reader, surely, merely an imperfect and partial one. Perhaps in longer essays, where there’s room to wrestle with an artist’s intentions (rather than merely praising or scolding the execution of those intentions), I’ve developed certain crippled ideas. I object to the characterization of Jarrell, who got under the skin of Whitman and Frost and Moore and Bishop in a way few critics have. He offered taste and a sensibility, and those have proved not only more useful than much systematic criticism, but more lasting. It’s important to remember that we go to Eliot and Jarrell for different things, and that poetry would be poorer for the loss of either. GD: If one considers, as a body of writing, the poetry criticism written in the first half of the twentieth century to that written in the second half, then clearly there was a marked deterioration. What caused it? WL: I’m not the only reader who likes to pick up issues of Partisan Review half a century old. The criticism there and in Sewanee and Kenyon and earlier in Southern and Hound & Horn seems thrilling now, yet these were just the sort of little magazines Jarrell complained of in “The Age of Criticism.” However odd or awful our own age, things can get worse. Much of the brilliant criticism in those journals was written by academic critics, many of them devotees of New Criticism (a label for a tendency, not the heading of a manifesto)—at this distance New Criticism seems to have been immorally suited to a poet’s habits of mind. The shame is that academic criticism now, so jargon-ridden and unreadable, is of such little use to poets. Postmodern criticism impoverished and corrupted, when it did not drive from the university entirely, a generation of serious readers—those who loved literature enough to study for the doctorate. But what has caused the deterioration, the near bankruptcy, of that poor cousin of criticism, the poetry review? Cowardice, if you like. Laziness, perhaps. Jarrell stopped reviewing poetry at forty-two, yet felt his career was shadowed and perhaps poisoned by it. (And yet wouldn’t we give up all but a few of his poems for his reviews?) I’m no less cowardly and no less lazy than other poets, but I was fortunate to review poetry in drowsy innocence until I was hardened in my ways. I wrote to please myself and my criticism met only silence. Perhaps it was the silence of compassion. There was an age, certainly, when poets felt it necessary to respond to contemporary poetry. But when was that age, exactly? The major romantics were not critics, apart from Coleridge. Nor were the major Victorians. (Poe is an exception among American poets, but Poe was not a major poet.) Much of our modern sense of a poet’s duty as a critic comes from Pound and Eliot (both in the shadow of Arnold). The poets of the following generation, Auden and Empson superbly, extended and complicated that achievement. And there is the lonely and brilliant example of Blackmur (followed and echoed, in an odd way, by Geoffrey Hill, another idiosyncratic and difficult critic). Weren’t Pound and Eliot just magnificent exceptions? The course of poetry criticism may be more dependent on the venues open, the fees paid, than on the lack in poets of a predatory instinct. Would we have more lucid critics if the New York Times Book Review paid $2000 for a review? Or would we just have wealthier cowards? GD: Is there some way to account for the fact that the vast majority of American poet-critics have been, and continue to be, politically conservative? From the New Critics to the New Formalists, many of the important poet-critics have been denounced for their political allegiances as much as their aesthetic ideas. WL: Eliot and Pound were founders of our avant-garde, and it’s easy to forget they had conservative principles—yet calling them politically conservative might be an error of tact as well as category (Pound was drawn to Roosevelt’s progressive politics, though Eliot might have given his write-in vote to George III). But what of Williams, in opposition? New Critics like Ransom and Tate certainly longed for a vanished South, the south of mules and Old Hickory (their poems are steeped in the whiskey of antique desire)—but you couldn’t say all the New Critics were conservative. The Partisan Review crowd were good Trotskyites, Jarrell was entranced by Kennedy, Lowell was a conscientious objector, and he and Berryman marched against the war in Vietnam. I don’t know the politics of most of the contemporary critics whose work I admire, and I certainly hope readers aren’t interested in mine. I write for magazines in all shades of the spectrum, so I am complicit with failed politics of violently opposed sorts. GD: What do you think of the yoking of politics to poetry, such a fixture of recent American poetry? WL: Those oxen rarely pull in the same direction. A politic poetry, as well as a political poetry, is tedious because it advances upon us with its motives scrawled on banners. It wears its slogans on its sleeve. Socialist painting, communist drama, political poetry—in such oxymorons there are only dustbin arts. I don’t say a poem can’t be political (among our contemporaries, Seamus Heaney has avoided or averted the difficulties—or suborned them in the service of art); but a poem whose purpose is political usually rouses a reader’s distrust, unless he loves the chill of propaganda, as some readers do. Poetry may succumb to such designs, but it’s not the purpose of art to make people comfortable in their prejudices. It takes a Heaney or an Auden to arouse our suspicions and seduce us anyway. Besides, isn’t part of the pleasure of poetry admiring poets whose politics you find despicable? It’s fortunate that we can’t always predict a man’s politics from his poetry. Many New Formalists are New Deal liberals, and I am told that one or two avant-garde poets vote Republican. It would be amusing, if so. WL: Probably a little of both. The collapse of artistic culture in big cities, the disappearance of warrens of young writers who criticized each other’s work (the writers are there, but social cohesion vanished with the literary jobs that supported it), created a need for artificial Sohos. Informal groups, inside or outside the university, have often aided the hothouse growth of young poets. (Weren’t the University Wits such a group, four centuries ago?) 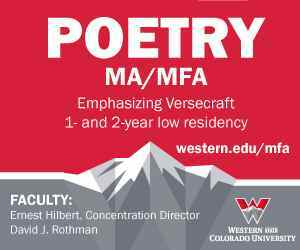 Writing programs are still rare in Britain; but poetry there is as numbingly conformist as in America, so MFA programs aren’t entirely to blame. Such programs are rarely academic or rigorous enough—they tend to be cordial and undemanding. I must declare my interest, having taught in an MFA program a long while and given some thought to its construction. In a workshop, the students often take means for ends. A poet may set his students a form and perhaps a theme, to give their imaginations skeletal structure (not necessarily traditional or metrical) and the ghost of a logic, just as quattrocento apprentices were asked to copy drawings by their master. The best students exceed the cost of those lessons. Less gifted students think writing a villanelle or a sestina or some cobbled-together form an end in itself. I’m all for occasional poems, and I don’t think every poem needs to be inspired—but it should come to its inspiration along the way. Much recent poetry reads as if it didn’t want to be written—it lacks any necessity or nemesis. And workshops often move toward consensus, grinding away a young writer’s originality, the burrs of his gift. Would American poetry have been worse had Pound made good his plans for an Ezuversity? Or had Auden continued to teach? It may be no bad thing to spend a short apprenticeship under poets who know something about the art. (I make no claims here for my own teaching.) We have almost all been affected, inspired, transformed by a good teacher (I will pay my debt here to two teachers who, late in my undergraduate career, taught me much I needed to know—David Milch and Richard Howard). Of course many MFA programs are full of mild and middling professors, time-servers, the almost-weres and never-wases. And there are students who travel nomadically, program to program, summer workshop to summer workshop, looking for advice to set in order the disordered house of their imaginations. Still, I would be wary of condemning an institution that produced, or provoked, poets as diverse as W. D. Snodgrass, Donald Justice, Philip Levine, Robert Bly, William Stafford, Mark Strand, Charles Wright, and Jorie Graham. WL: Is it so awful that poets are patronized? I’d rather throw my taxes at crop after crop of poets than crop after crop of tobacco. You don’t want poets to get settled and lazy, so perhaps such awards and grants should be rare and capricious. Only recently have we freed ourselves, in our democratic way, from the notion of private patronage (a notion still current in John Quinn’s generosity to Pound and Eliot). But the world was not better when poets had to bow and scrape before lords—think of Shakespeare’s weaselly dedications, and the tone of his first sonnets, which make my flesh crawl. Apart from some odd examples like Pope (who grew rich from translation) and Byron (who hardly needed the money), poets have not written their way into fortunes. Before the twentieth century many poets were, if not wealthy, at least able to escape daily labor. When you read the biographies of most of the great poets from Milton to Lowell, you think, didn’t any of these folks have a steady job? (I don’t mean to denigrate Milton’s work as Latin secretary to the Council of State.) Williams’s medical practice and Stevens’s insurance work were dedicated but oddball exceptions. The cant of “arts administration” is creepy and dispiriting, and applying for grants a dreadful trade, though perhaps a necessary check to a poet’s pride. Poetry is such a difficult art, often such a minor art, these small emoluments create no sense of privilege in the recipients. The ordinary reaction is relief—at having gained an hour or a month or a year for indulgence in the art. Perhaps the Croesus-like awards given (for “lifetime achievement,” whatever that might be) to poets long into cozy retirement should be scattered like seed corn among poets under thirty—that would be a start. Governments have patronized the arts without destroying them, or destroying themselves, though our sentimentalities blind us to the examples. The art of trecento Siena was bought by state patronage, not the riches of counts or dukes. Not long ago the Works Progress Administration proved that government is not always the enemy of art. Maya Lin’s Vietnam War monument is one of the most beautiful and stirring of public sculptures. And yet the money for “public” art worked into the budget of every federal building is a feather bed for mediocrity. Where is the Semtex when you need it? WL: A critic should answer that question with his reviews, and I hope I’ve answered it in mine. WL: I’ve recalled at length, in the interview at the end of All the Rage, my fondness for the criticism of Geoffrey Hill, Christopher Ricks, and George Steiner. Let me mention a few critics less well known. I think Michael Hofmann the most distinguished of the younger critics. I must declare an interest again, because he is my colleague at Florida; but his collection of essays, Behind the Lines, is thorough and original. James Fenton has written thoughtful left-handed pieces on poetry, most still uncollected; and Craig Raine is as cheerfully combative and learned as Jarrell. These critics have written mostly for British journals. Among younger American critics, Adam Kirsch and Christian Wiman are both worth attention and argument. WL: Let one stand as an example—Gjertrud Schnackenberg’s luminous and insufficiently appreciated The Gilded Lapse of Time. WL: No, no, and alas no, but we can hope to keep the uncommon readers we have always had—the dispossessed, out-at-elbows readers, ones who would rather curl up with a book than watch football or play a computer game. Perhaps these readers will grow fewer and unhappier (which means that most poetry books will sell their five hundred or a thousand copies, just as they did when the country was much smaller). Surely the worst way to create readers is by praising everything under the skies—I’ve read many a review, perfectly convinced by the logic of its praise, only to laugh out loud when I came to the poems themselves. (The worst criticism can’t even lie convincingly.) Expecting poets to review their friends harshly (or even their enemies), expecting those who judge contests or awards to be impartial, is no doubt naive. The fault is no less despicable—or disappointing—for being human. When we have a criticism that does nothing but praise, readers know poetry critics are idiots. We aren’t going to regain the lost readers of the nineteenth century, those who didn’t know radio or television or the Internet, who were educated in French and Latin, who as children read Milton and Shakespeare and could bash out a decent verse themselves (one that scanned and rhymed effortlessly, if without originality). Those common readers of poetry are long in the grave, and they were readers differently trained and with different expectations from readers now (they expected moral virtues from poetry, or at least moral suasion). Even if we could have those old-fashioned readers again, would we want them? The embedded question is not, “What sort of poetry would gain those readers now?” but “What sort of poetry would attract more readers than we have?” The probable answer is an uncomfortable one—a poetry that catered to the sentimentalities of its audience. Criticism is likely to grate against such sentimentalities. GD: What do you think of the recent revival of performance poetry—the so-called “poetry slams”? WL: It costs little to be tolerant of such a goofy form of entertainment. I doubt any lasting poetry will emerge from it—I’m still waiting for lasting poetry to come from rock lyrics. WL: I certainly hope so. Why write criticism if it’s so trivial it doesn’t have a cost? I’ve been warned, often enough, that writing criticism is suicide (that would make a pleasant story by Borges); yet I can’t say my poetry has suffered in reviews, can’t say I’ve faced real disfavor. Because criticism rouses passions, because it has more currency (and is sometimes easier to understand), there are readers who think of me only as a critic. The poet mildly objects. There has been a certain baying after me on the Internet, I understand. I’m not sure such readers have the best objections to my reviews; but to reassure them perhaps I should say that, unlike Housman, I don’t store up witty sayings in a notebook, to use as occasion arises (though I might wish I did); that I don’t review books to call attention to myself (too much attention is likely to make me stop writing criticism altogether); that my harsher criticism isn’t motivated by envy, as far as I can tell (envy is what makes me write good reviews, not bad ones); and that I’m amused by readers who say so violently that I should be more mild. Readers who assume I don’t praise other poets, and who have failed to discover long essays of appreciation on Pound, Frost, Auden, Bishop, Wilbur, Hill, and others, have not read very deeply. If criticism has cost my poetry something, it can be only a thing of limited value. I’m not trying to be high-minded—my poetry must make its own way. Poets are always complaining they haven’t received their due—that they deserved this prize, were cheated of that grant, that X got it first, or Y when he was younger. Most writers get more than their due. Logan’s prose in this interview (clearly a written, rather than oral, prose) makes me envious and leaves me awed. Garrick Davis raises the most important questions for any sort of criticism. Both are as aloof as gentlemen should be.